David Stern was in the house for tonight’s game, and the Pelicans made it clear just how much they appreciate him. A video tribute titled “Thank You David Stern” preceded a short ceremony where Governor Bobby Jindal, Mayor Mitch Landrieu and the Bensons gifted Stern a special Pelicans jersey to thank him for his efforts in keeping the NBA in New Orleans. Some Lakers fans felt the need to boo, likely for basketball reasons. Attention to Attendance: As I predicted earlier in the day, the combination of the Lakers mediocrity and Kobe’s absence led to a much smaller number of Lakers fans in attendance than we’ve come to expect over the years. Pelicans fans packed the house. @BourbonStShots that alley oop just woke up Tom Benson from a nice slumber. Joseph Warren Gerrity IV’s Examen de la Nourriture: This evening I sampled a New Orleans classic– the shrimp poboy from outside section 121. It cost me 11.50 which is a bit much for a poboy, but not outrageous by any means. The shrimp were prepared well, although there were not quite enough of them to fill the sandwich. The bread was a bit dry, but otherwise pretty standard. It came dressed with fresh tomatoes and lettuce, with some creole sauce on the side. It was accompanied by potato chips. There was Tabasco hot sauce available as well, but no Krystal. C’mon now. In all my time in New Orleans there has only been one poboy that I would not eat again, and it wasn’t this one. Four stars. Probably Not on TV: The Pelicans aired a video special in between the first and second quarters titled “Thank You David Stern”. That was followed by the Governor and Mayor being joined by the Benson clan to present Stern with a Pelicans jersey. Also, they were doing air testing throughout the Arena during the game. No word on the results, but I’m expecting it to be at least 20 proof. Halftime Entertained? YES. Olate Dogs put on a dog performance like I’ve never seen. A blend of comedy and general awesomeness led to some of the most genuine smiles I’ve ever seen in the crowd. So many awesome tricks. If you didn’t come to the basketball game for basketball, this is what you came for. 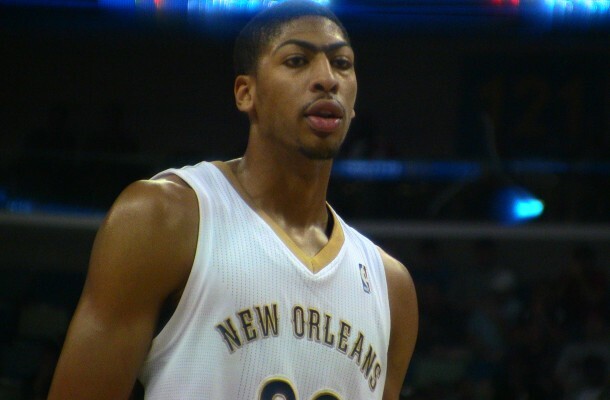 Off Court Statistic du jour: One- The number of times that an MVP chant broke out for Anthony Davis, which if I’m not mistaken is the first time that has happened. Pregame entertainment: David Stern spoke and took questions before the game. Andrew will have the full video up by tomorrow. Weak Sauce: One fan had a chance to score a serious gift card to Luke, but he managed to go 0-12ish from the free throw line. Ouch. The fan who preceded him in the on court competitions completed every shot and won a trip to Biloxi. Pic of the game/ Caption Me! I seriously think someone talked to Monty about the rotation. It looks like he finally realized our starters need to play 35-40 mins a night. Davis and holiday played closed to 40 and looked great. We have young, fresh, and fun team. Let these stallions run all night. I would like to see tyreke get in more of a rhythm. Can’t wait for Ryno to come back. Peddle to the metal Monty!!!! That should be “petal to the mettle”, right? Not traded for an SF or Center will be trobule for Monty & Demps because i wouldn’t trust Aminu or our group of center with a check.